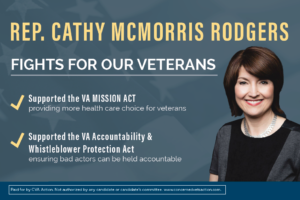 ARLINGTON, VA – Concerned Veterans for America Action℠ (CVAA) on Monday announced its support for Rep. Cathy McMorris Rodgers (R-Wash.), pointing to her consistent support for and leadership on critical veterans’ issues. The group is launching a direct mail campaign urging support for McMorris Rodgers at the ballot box. The mail piece specifically cites her support for two recent major VA reform measures, but the group’s senior advisor, Dan Caldwell says the lawmaker’s record shows support well beyond votes in Congress. View THE mail piece here. The mailer highlights a pair of bills McMorris Rodgers voted in support of – the VA Accountability and Whistleblower Protection Act, a law to ensure bad actors at the VA can be held accountable for their actions, and most recently the VA MISSION Act, a law to provide more health care options for our nation’s veterans. Also of note, she introduced the Modernization of Medical Records for Veterans Act, which would require the VA to have a pilot program that would test out transferring patient records to digital copies, a major undertaking at the VA to safeguard veterans’ medical information and deliver better continuity of care as veterans transition to civilian life and beyond. Secretary of Veterans Affairs Robert Wilkie recently announced Spokane would be a test location for the conversion of veterans’ medical records into electronic form, saying the area will serve as the template for the rest of the country. Wilkie made the trip to Spokane on Rep. McMorris Rodgers’ invitation. In 2016, she was the original co-sponsor of the Faster Care for Veterans Act, a bill requiring the VA to make it possible for veterans to use available technology to self-schedule appointments, streamlining bureaucratic processes and making the VA more responsive to veterans.